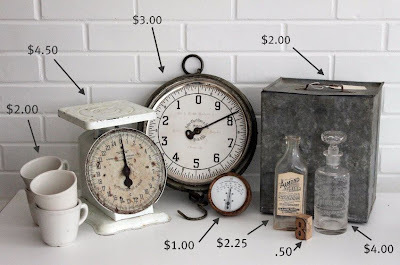 Vintage Home & Garden: can you buy happiness for under $20? Usually, I would say...no...but today...I have to give it a big fat YES! I had a day all to myself today. It was so nice...I rambled from thrift shop to antique shop throughout my city searching for just the right things that needed to come home with me! I keep my "style" a pretty good secret around here. Not many people in my area are into the same look I am...so I always seem to luck out with these beautiful treasures for such a small price. They laugh at me and one old man today actually said "little lady, we need to teach you what actually has some worth...and it sure isn't this old stuff!" I never correct these silly men, I just smile and play the dumb girl role to make them happy. I scored some lovely bits and pieces for around the house, so thought I would share my finds. I could not believe my luck today! Don't you just love it when that happens? There is nothing better than coming home with a trunk full of old stuff to make a girl feel good! You should see the wire baskets I brought home. Seriously to-die-for! The 'man' I referenced above thought I was nuts for wanting them, so gave them to me free. Not such a dumb girl afterall, eh?? 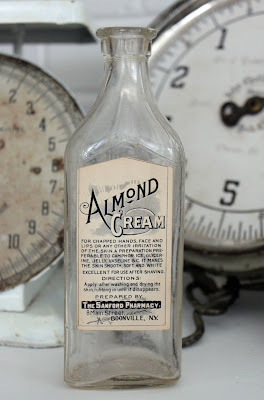 I am in love with the graphics on this bottle...I can't believe what good shape the label is still in after all these years! 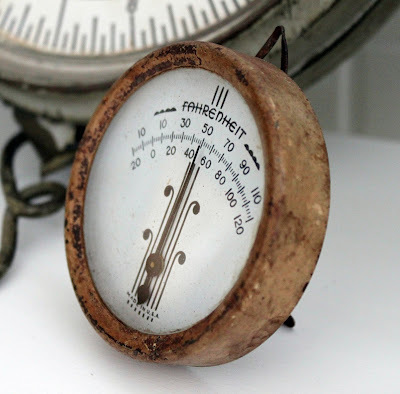 This little tabletop thermometer makes me smile...not just because it's lovely patina is in my palette...but it reminds me of my Dad. Before he retired he was a Meterologist...aka 'weatherman' for the US Government. Ever time I hear a weather report...I think about him. Growing up in the country we always had an old radio with a button you could push that would take you directly to the weather station. I would push it every once in a while because I thought it was cool to hear his voice on the radio. When I would visit him at his office, he would let me go into the recording studio and I would sit on his lap while he taped the days report. Ahhh...I love memories like that. 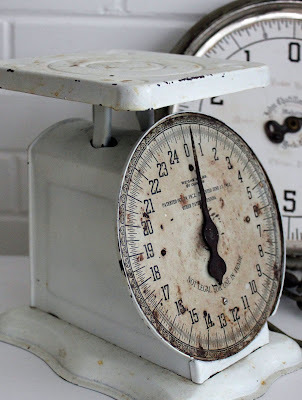 Oh, and this crusty, rusty kitchen scale is perfection in my eyes. 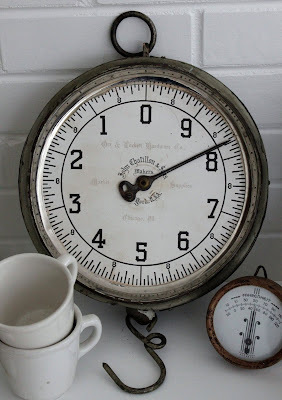 Love the white...love the rust..but did I really need another vintage scale?? I already have 7 of them...but yes, I guess 8 is my lucky number so its joining the collection! Speaking of scales...this was the best find of the day! And the price??? Yep, thats right...$3. Three stinkin' dollars??? I can't remember the last time I bought something I was so in love with for that little! It is a hanging scale with a dial on both sides. This baby is going in my kitchen! Oh, and I can't forget the ironstone mugs...I have a shelf just waiting for those. I just want to give a great big THANK YOU to all of you dropped me a little note to ask about my mom. You girls are just the sweetest...it means so much to have you guys care! She is doing better...not 100% yet...but she is improving a little bit every day so I am happy with that. Holy cow - You SCORED! Love every single find. And I'm shocked over the prices! Were these from antiques shops? Dang!! Love all of your treasures. Silly girl. Ha Ha Ha. You are such a lucky duck, great finds! I love every single piece. ! Great pieces...can't believe the prices!! Great pieces and great prices, they would never be that cheap if I found them! Wow! Great finds and prices...way to go! I would love to find these marvelous treasures. You hit the jackpot and for such little money. Great job!! Sweet deals, Mary! Did you jump up and down and giggle and clap your hands when you got home? I know I would have. I love the history with your dad and I'm happy to hear that your mom is doing better too. I love your finds. Unfortunately, they have figured it out here and I would never be able to get those items for a great price like that. Love the hanging scale. Holy COW...are you kidding me???? I want to go shopping with you! I cannot believe those prices! And I love them all ~ and I really loved hearing your memory about your dad...that is really sweet! What a wonderful deal!! 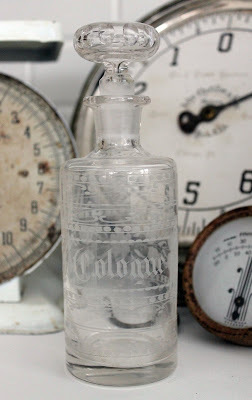 I just love the patina on all of the goodies you found!!! I am sorry to hear about your Mother but glad she is okay and getting better..that is SO scary!! The big 50 Birthday Bash looks like fun!!! I am looking forward to seeing what your do!!! Wow! You found some great things!!! I think I'm in the market for a scale now! lucky lucky girl! I've seen girls on etsy price their scales for massive amounts! when do you want to meet up for coffee? That is an awesome day shopping!!! what great finds! The high from that shopping trip would last me for a long time. Love the mugs. OK, so where do you put all the cool stuff you find? I drag home awesome finds, but am feeling overwhelmed by the quantity of goodies! It's stuff I just can't pass up! WOWZA! You did good girl. oh what fun! I love days like that. COMPLETE SCORE! please post pictures of your wire baskets! wow -- I don't think I've ever scored such a fantastic collection. I can't believe you found all of those coordinating pieces in one shot! you a great, great eye! I'm so envious over here - I LOVE it all! You know my sisters & I have men do that to us all the time! We found a to die for old pink dresser with chippy paint - turquoise under the pink - for $40! Then the guy told us about all the work it needed to be stripped down & fixed back up - umm no thank you - they are really the silly ones!! It's now in Aubrie's room and it's still gorgeous as is :) I want to go shopping with you - you have some awesome hot spots! Love to catch a great bargain. It is all cool stuff!